Christina came to me a few days ago and asked if I would like to help develop some kaleidoscope programming for the MAKESHOP. Christina is an expert at kaleidoscopes. She designed and built a giant kaleidoscope for our Tough Program (Check it out!). I, on the other hand, can barely spell “kaleidoscope.” I immediately jumped on board this project because it is something new and interesting. We met and discussed the logistics of the project: material costs, assembly, differences between the program on weekdays vs. weekends, etc. The real fun came when we started building our prototypes. We scoured the basement of the Museum looking for anything we could use. We then took the materials to the MAKESHOP and started tinkering around. The things we created were interesting, but we also learned a lot by simply doing the project. I’m excited to prototype some more ideas for this project (I’m usually excited to prototype anything). Christina and I had a good time building kaleidoscopes and are excited to try this project with our visitors in the near future. Until then, the two of us will keep prototyping and playing. 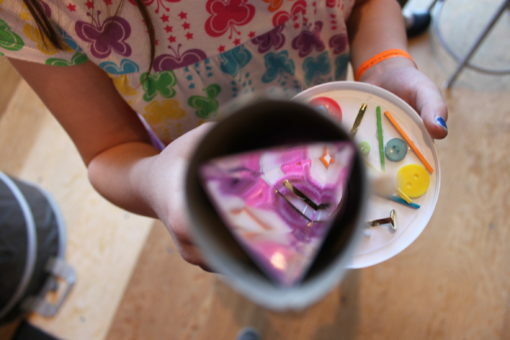 Check our blog to find out when we will be building kaleidoscopes with our visitors!